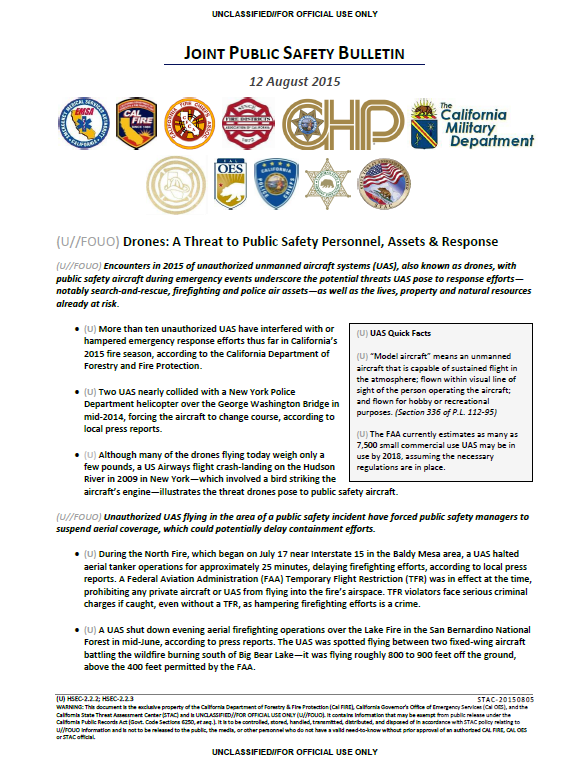 The following document was obtained from the website of the California Fire Chiefs Association. (U//FOUO) Encounters in 2015 of unauthorized unmanned aircraft systems (UAS), also known as drones, with public safety aircraft during emergency events underscore the potential threats UAS pose to response efforts—notably search-and-rescue, firefighting and police air assets—as well as the lives, property and natural resources already at risk. (U) More than ten unauthorized UAS have interfered with or hampered emergency response efforts thus far in California’s 2015 fire season, according to the California Department of Forestry and Fire Protection. (U) Two UAS nearly collided with a New York Police Department helicopter over the George Washington Bridge in mid-2014, forcing the aircraft to change course, according to local press reports. (U) Although many of the drones flying today weigh only a few pounds, a US Airways flight crash-landing on the Hudson River in 2009 in New York—which involved a bird striking the aircraft’s engine—illustrates the threat drones pose to public safety aircraft. suspend aerial coverage, which could potentially delay containment efforts. (U) During the North Fire, which began on July 17 near Interstate 15 in the Baldy Mesa area, a UAS halted aerial tanker operations for approximately 25 minutes, delaying firefighting efforts, according to local press reports. A Federal Aviation Administration (FAA) Temporary Flight Restriction (TFR) was in effect at the time, prohibiting any private aircraft or UAS from flying into the fire’s airspace. TFR violators face serious criminal charges if caught, even without a TFR, as hampering firefighting efforts is a crime. (U) A UAS shut down evening aerial firefighting operations over the Lake Fire in the San Bernardino National Forest in mid-June, according to press reports. The UAS was spotted flying between two fixed-wing aircraft battling the wildfire burning south of Big Bear Lake—it was flying roughly 800 to 900 feet off the ground, above the 400 feet permitted by the FAA. Denote any interference with aircraft in flight.